Apparently we live in bizarro world where there is a debate about whether to let the Bush era tax cuts for people making over $250,000 expire. I thought we already decided this back in 2008 when we elected Barack Obama and rejected 8 years of Bush economic policies which had nearly sent us into a second Depression?! Seriously, am I totally off base here? Day after day I see Republicans on my teevee talking about how it would hurt the economy if we raise taxes on the rich folk. Excuse me while I go shed a tear for those who won't be able to purchase another summer share in the Hamptons. (Who am I kidding no one making $250k can afford a summer share in the Hamptons). But seriously I do not understand how this message is working at all with mainstream America since so many people are unemployed or underemployed and a large majority falling well under $250k. 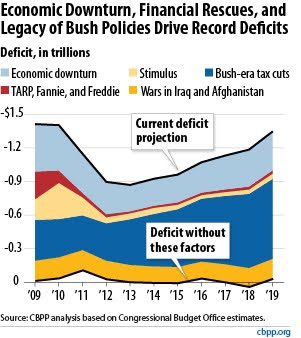 So why would it be a ridiculous idea to extend the Bush era tax cuts in order to get the deficit under control? As you can see above the Bush Tax Cuts are the big blue blob in the middle. But yeah Republicans are so very worried about the deficit and we should elect them again because it worked out so well in the past. Takeaway, people making $60k-$150k will pay slightly more if we keep the Bush era tax cuts. This chart was originally published in the communist paper of record named....wait for it....The Wall Street Journal. Tell a friend.